Some serious New York love this week, where the sun is shining, the cherry blossoms are out and bikes are parked at every street sign. The French and English combination may have been completely unintentional, but the message rang true regardless. When it comes down to it, bikes and travel go hand in hand. 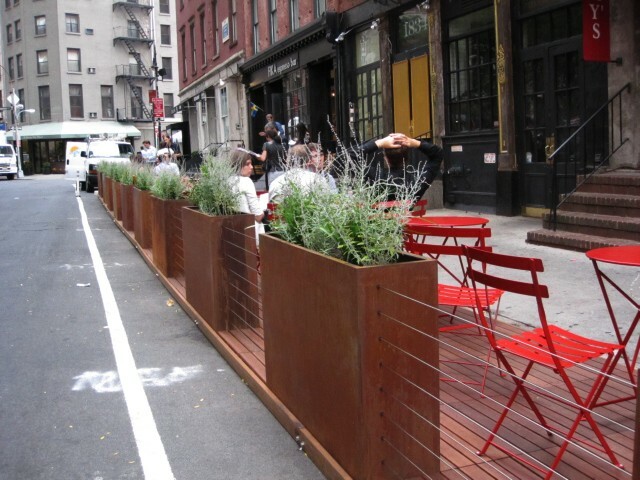 Sponsored by two neighboring eateries – Bombay and Fika – and the New York City Department of Transportation, the pop up cafe is composed of a wooden platform that houses 14 tables and 50 chairs. An attempt at solving the problem of cramped sidewalks which don’t leave much room for outdoor seating, the pop up cafe is part foodie attraction and part public space improvement. In fact, Bombay and Fika don’t offer table service, and anyone who wants to take advantage of the space is allowed to take a seat. NYC cycling is its own special thing. Stop signs don’t really count as stop signs, stop lights are merely for good measure and even designated bike lanes aren’t really like bike lanes in any other city; at least people believe in helmets. But that’s what makes riding in the city fun. 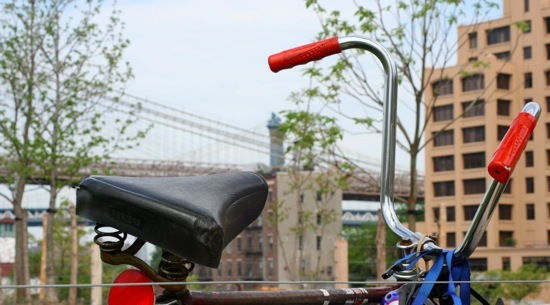 Ringing the bell incessantly as you cross the Brooklyn Bridge and having to maneuver around children flying by on wooden trikes. Dodging tourists in Chinatown with that smell of outdoor markets and produce hanging in the air that’s reminiscent of previous visits to Asia. Raising your hand in disgust at the drivers completely oblivious to the fact that a bicycle was ever invented. But on two wheels, the big city feels manageable, even more friendly. Which is why you keep ringing the bell. 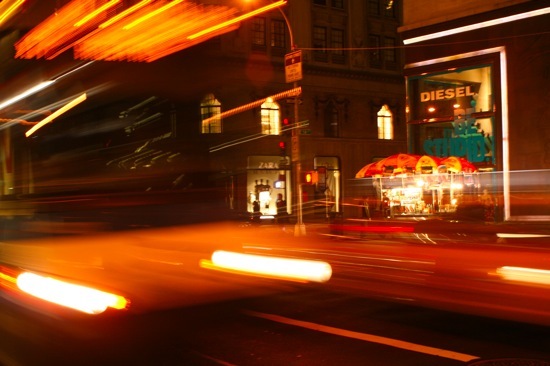 No tripod, strange Diesel storefront in the background and a bus driving just a bit too fast. The city that never sleeps; a true statement.